"Clem McCarthy was the class of sports announcing." The late, legendary racing announcer Clem McCarthy thrilled racing fans for over 20 years with his gravel-voiced, machine-gun accounts of horse-races. McCarthy described every Kentucky Derby from 1928 to 1950. 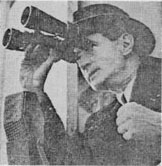 Clem McCarthy made his first radio broadcast from Churchill Downs at Louisville, Kentucky in 1928 for station KYW in Chicago. In 1929, he joined the National Broadcasting Company, where he remained until 1947. One of his best known racing calls, the 1947 Preakness, ended with a famous mistake. McCarthy called a horse named Jet Pilot the winner, instead of the actual victor, Faultless, because crowds were blocking his view, and both horses carried red racing silks. Jet Pilot finished out of the money entirely. McCarthy, in his raspy voice stated, "Ladies and Gentlemen, I have made a horrible mistake. Babe Ruth struck out. Today I did the same. I am in distinguished company." In addition to racing, McCarthy also covered a number of major prize fights. One of his most famous fights was the 1938 return bout between heavyweight champion Joe Louis and Max Schmeling of Germany. McCarthy covered the Kentucky Derby for Columbia Broadcasting System and his last assignments were at Roosevelt Raceway. The American Sportscasters Hall of Fame is proud to induct Clem McCarthy into the Sportscasters Hall of Fame.